Toilet Paper Blaster Skid Shot - Turn Toilet Paper Into Spitballs! Home online deals Toilet Paper Blaster Skid Shot – Turn Toilet Paper Into Spitballs! Have lots of toilet paper in your stockpile? Your kids will love what we found on Amazon! It’s temporarily out of stock but you can still order the Toilet Paper Blaster Skid Shot from Amazon and it will ship when it becomes available! This blaster fires toilet paper up to 30 feet! It transforms toilet paper into clean spitballs (uses water and not spit)! Although stock is limited, be sure to check online to see if they have this in-stock at Walmart.com! Amazon Prime members get FREE 2-day shipping (when it becomes available)!! If you are not a Prime member, get FREE shipping when you purchase $25 or more of eligible items across any product category. Holy Sheets! Toilet Paper Blaster fires toilet paper up to 30 feet! Uses regular Toilet Paper: 2-Ply works best to Wipe-Out the Competition! 1 Roll = 350+ Spitballs! (2 spitballs per sheet). Includes 3 cutout targets on package. No batteries required. Don’t call a plumber! Slight water leakage is normal during play. 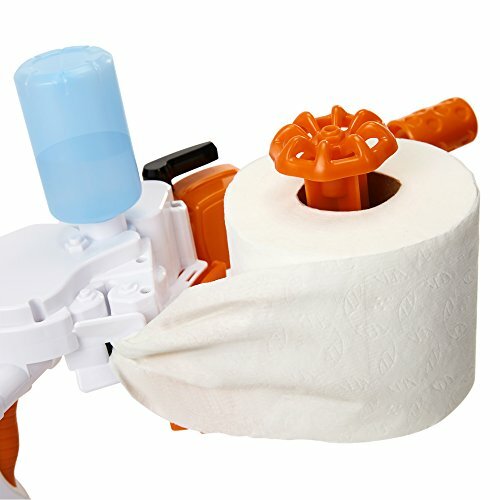 Buy the Toilet Paper Blaster Skid Shot from Amazon.